With Valentine’s day a little over a week away, I thought I would post some delicious chocolate covered sweets for you to share. These recipes are fun, frugal and easy and can be adjusted for most any holiday. Happy Snacking – Enjoy! Line a baking sheet with parchment paper and set aside. 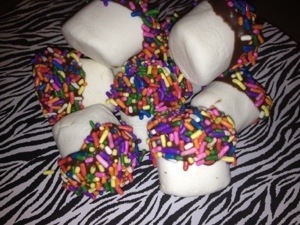 Place sprinkles in a medium bowl and set aside. Dip one pretzel into the milk chocolate about halfway up, twist the pretzel around to let the excess chocolate drip off. 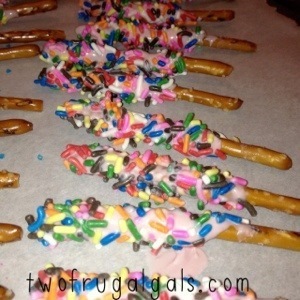 Hold the pretzel inside the bowl of sprinkles and twist the pretzel around to allow the sprinkles on all sides. Place the pretzel on another piece of wax paper to dry. Continue until you’ve made your desired amount. Place pretzels in the freezer to shock into hardening. Pretzels should be stored, sealed in an airtight container at a cool room temperature. Pop your popcorn. While it’s popping lay a piece of wax paper on a cookie sheet. Once your popcorn is popped pour into a bowl and remove all extra kernels that haven’t popped…those aren’t good even covered in chocolate Melt about 3/4 cup of chocolate in the microwave. I always start with 30 seconds then continue in 15 second spurts stirring in between. Slowly pour in the melted chocolate while stirring with the other hand. It mixes much better if you stir and pour at the same time. Lay out your popcorn on the wax covered cookie sheet. Try to take the spoon and separate the kernels and give them a little space. 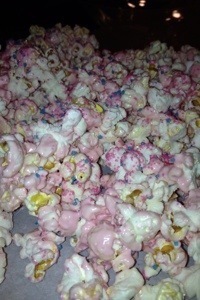 If you don’t do this you will end up with big clumps of chocolate popcorn. Let the first coat set for about 10 minutes. And there you have it! Chocolate covered popcorn…now just package it up cute and serve. In a 1-cup glass measure, heat together chocolate chips until chocolate is melted and smooth when stirred. Using a fork, dip each marshmallow into chocolate over a cup. Place marshmallows 1 inch apart on a wax paper-lined baking sheet; immediately sprinkle sprinkles or the nuts on top, if using. Refrigerate until chocolate is firm, 45 to 60 minutes. Store, covered, in refrigerator. Enjoy! You might also like these Chocolate Treats!